The City of Nairobi has recently undertaken a vigorous initiative aimed at reclaiming wetlands. This is part of a wider city regeneration campaign by the Central Government. The campaign includes improving of the urban transport system, affordable housing and cleaning the Nairobi River basin. The strategy is well intentioned although critics disagree with the manner in which it is being executed. Initially, the authorities painted red lines along a highway to indicate a Bus Rapid Transit Lane. There was no communication after that. More recently, the city has been demolishing buildings constructed on riparian areas. This has elicited mixed reactions from the public, civil society and professionals. Nairobi lies in what was once a swampy area by virtue of its location at the border of the Highlands and the Kapiti Plains. The city has several rivers that originate in the highlands and flow towards the larger Athi that drains into the Indian Ocean. Over the last 100 years urban development has led to the draining of many ‘swampy’ areas for more optimal use. Examples include parts of the Central Business District that a century ago were uninhabitable. Poor planning, coupled with the expanding need for human settlement has seen both the formal and informal sectors take over riparian areas and wetlands. Due to these prevailing circumstances the city recently started demolishing structures along riparian areas. A riparian zone is a vegetated strip of land located on each side of a watercourse or adjacent to a stationary water body. These zones are ideal spots for a merger of ecological, social and economic functions. 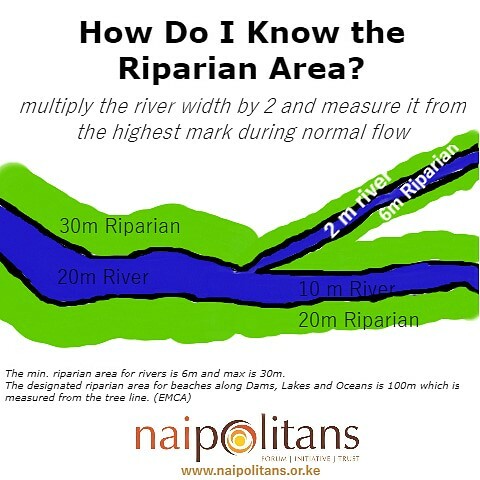 Kenya’s riparian laws state that there should be no permanent structures constructed between 6m to 30m of the high watermark of the river. This varies according to the size of the river. The general provision is 2 times the river width with a minimum requirement of 6 and a max of 30m. Dams, oceans and lakes are allocated a riparian area of 100m. In many cases, urbanization has invaded these areas, leading to reduced ecosystem health and vitality. Urban developers are known to dump waste (sewer) in rivers. Others eliminate the vegetation in the area (that contributes significantly to the absorption of nitrates and other toxins). Some have even attempted to divert rivers leading to massive urban floods. Many informal settlements have also developed along the riparian lands. Most of the urban laws and ordinances do not take into account the existence of the urban poor. In rural areas, some agricultural practices are also known to have caused harm to the riparian areas. These practices adversely affect the healthy freshwater systems of water bodies. The benefits of vegetative buffers around riparian areas have only recently began to be appreciated. Buffers filter sediments and contaminants from the runoff (in some cases 90% of nitrate input) and provide soil stability thus reducing erosion. During high water seasons, they provide an avenue for distribution of water so as to prevent urban flooding. Besides that, they provide opportunities for recreational space, garden waterfront areas and water temperature control. All these can also be translated to financial benefits in the hospitality sector. Streams with good buffer zones also show rapid improvements in visual water clarity and channel stability. Another analysis on the Nairobi River derived that there is a negative user perception and sub-optimal design of space. This is deemed to have been caused by population growth, land scarcity, poor land use management and ignorance of regulations by the general public. Impunity by authorities has also been said to have played a major role in the encroachments. The riparian encroachments have been identified as a key reason behind Nairobi’s failure to adapt to changing weather conditions for instance heavy rain and the resulting urban flooding. Stories of ‘buildings of death’ have also emerged over the last two decades with poor building inspection and development control measures implemented in the city. (Ref – previous articles on these topics). In many African cities, unplanned urban development has ignored environmental sustainability. This has resulted in deforestation, pollution of rivers, grabbing of public spaces as well as the constant and intentional ignoring of zoning regulations and building safety requirements. In simple terms, lack of planning! A recent study found that Vancouver suburban residential values were higher for those residences in the nearby vicinity of a greenway. The results of the assessment and the survey indicated that property values are positively affected by proximity to a greenway. Local residents also valued the greenway above many other features of their neighbourhood. Similar studies have also been carried out in Japan, Estonia, and Australia where the value of riparian green space has been attributed to more than just environmental and ecological reasons but is also viewed as involving social and cultural appreciation. An ensuing debate relates to the question whose responsibility it is to maintain and take care of the riparian areas. Although the duty would primarily belong to it, a government`s ability for, and commitment to the task, is highly questionable. Opportunities can be found in the manner in which the zones are recognized or designated. This can possibly be as ‘public spaces’ with multi-user approach. Adjascent land owners can also be authorized to maintain them. This would help in health and safety at the various locations. As Nairobi continues to regain its riparian areas, it has to adopt a range of approaches. The diversity in relief, vegetation and density of development of the city provides a big opportunity for such options. Strategies for the built up areas can be implemented in a different manner from the rural upstream areas. This can also differ at the informal developments that have come up along many rivers. The current initiative also affords an opportunity for further reclamations and repossessions. Especially of public spaces, road reserves and way leaves. Many of these have been taken over by unscrupulous developers and greedy politically- connected individuals. How do you think the restoration of riparian lands and rivers should be approached? What successful approaches have other cities made towards restoring clean rivers and healthy environments?